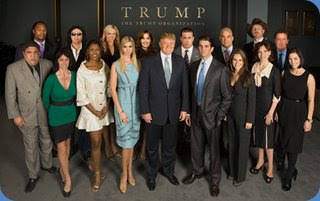 Did you catch The Celebrity Apprentice last night? Wharton alumni Donald Trump (W'68), Ivanka Trump (W'04), and Don Trump Jr. (W'00) are back for a seventh season (Thursdays, 9pm NBC) with a whole new twist where celebrities play to earn money for their charities. Having been a fan of the show and a former web producer for the Yahoo! Apprentice site, I've got to say from what I can tell, this season is pretty good. Mostly because of the personalities of the attention seeking Omarosa, the somewhat cocky Piers Morgan and the crass Gene Simmons. The best part of the show so far is watching Trump and these "celebrities" (and I'll use that term loosely) interact. While these celebrities will be playing for charity, it will be interesting to see how the season pans out when the stakes to become the winner aren't as personally high to these celebrities as compared to past season's candidates. Also, I do think the show works better back in New York. What do you think? "Contestants will not be vying for a job with Donald Trump, but the business-savvy celebrity contestants will be working towards a greater goal -- as they raise over a million dollars for their various charities throughout the season. Not only will the final winner be crowned the first 'Celebrity Apprentice,' but he or she will also have the honor of delivering a $250,000 bonus check to their designated charity. All 14 celebrities will be competing in business-driven tasks around New York City, using their fame along with their proven business acumen to win challenges, while ultimately raising money and awareness for their respective causes. Just as in the regular "Apprentice," the celebrities will be subjected to long hours, grueling mental challenges, personality clashes, and intense scrutiny -- all without the help of their regular support system of agents, managers, and personal assistants. Certain tasks encourage the contestants to reach out to their network of celebrity contacts for assistance or donations -- making for entertaining surprise visits by some of the world's biggest stars along the way. All of the tasks will be judged by Trump and his advisors in the boardroom. Returning back to the boardroom are Trump's children (and colleagues) Ivanka and Donald Trump Jr., alongside longtime Trump Organization employee and "Apprentice" advisor George Ross. In a new twist, the boardroom will feature a "rotating seat," allowing a variety of famous business leaders and industry legends to join Trump in spirited judgment on tasks for the first time in the series."